Home ArcGIS Visibility Analysis for ArcGIS Explorer: Where’s that wind turbine? Well here is an interesting tool for the increasingly popular and powerful free ArcGIS Explorer, select a point on your map and run the tool. Hey presto I will be able to see that wind turbine! Now fitting in with topical ideas of big societies and local empowerment, I can imagine some communities using these types of free tools to analyse for themselves the impact of new development. There are more tools and add-ins being developed for ArcGIS Explorer and one wonders whether GIS professionals will be in trouble! 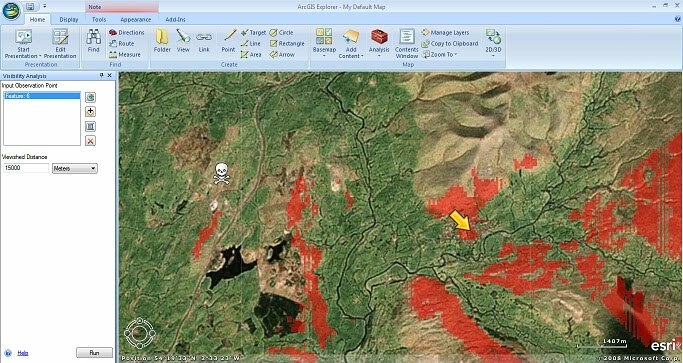 Update: Looks like my link was very clear so here it is again ArcGIS Visibility Analysis tool. beauty – Apologies if that wasn't clear I've added the link again at the bottom. Looks like I need to change my link colour text!